Uma casa de nível do lago (1564 Sq Ft) piso plano aberto tem todo o conforto de casa. Acomoda um máximo de seis pessoas em dois quartos privados: Quarto # 1 tem uma cama de casal e uma cama de solteiro e quarto # 2 tem uma cama de casal e uma cama de solteiro. Uma casa de banho completa com chuveiro. Todos os quartos são alcatifados, exceto o banheiro e cozinha. As comodidades incluem roupa de cama e toalhas de banho, lavadora e secadora e um grande comer na cozinha totalmente abastecido com tudo que você precisa para desfrutar de jantares de família; Espaçosa sala de estar e uma família separada / marquise com lareira a gás. Desculpe - sem animais de estimação ou permitido fumar! Relaxe e aproveite o ar livre com uma vista panorâmica do lago a partir do deck espaçoso - deck com vista para um quintal grande nível de horas de jogos em família e diversão. Uma mesa de piquenique, espreguiçadeiras e um grelhador a carvão são fornecidos. O quintal é pulverizado para mosquitos e carrapatos bi-semanais para ajudar a fazer noites agradáveis para os smores ao redor da fogueira à beira do lago. Um cais privado é fornecido para amarrar seu barco, para nadar e para sentar e assistir o mundo passar. A calçada pavimentada tem espaço para o seu estacionamento de barco / reboque de barco. Bay Lake está no coração da área de lagos Brainerd e é um lago de 2.435 hectares repleta de baías, pontos e ilhas e é um dos melhores lagos de pesca do robalo em Minnesota. Datas de abertura de pesca para a temporada de pesca 2019/2020 para a maioria das águas interiores são as seguintes: walleye, sauger, pique do norte, baixo e truta do lago, 11 de maio; muskie, 1 de junho. A temporada de pesca de crappies, sunnies, percas e bagres é contínua. Para regras, regulamentos e outras informações úteis sobre pesca em Minnesota, consulte a página da Fish Minnesota da DNR. Não se esqueça de embalar suas iscas e postes favoritos. Ancorar o seu barco e desfrutar da praia pública na parte de trás da Igreja da Ilha e / ou caminhar a ilha de 60 hectares, que também é lar de Bay Lake Camp. Sugestões para trazer: alimentos e bebidas, recipientes de armazenamento para overs, prato, sabão para mão e lavanderia, shampoo / artigos de higiene pessoal, toalhas de praia, protetor solar, coletes salva-vidas, brinquedos aquáticos, CDs, DVDs, equipamentos de pesca, insetos, artigos de piquenique (guardanapos, placas de papel, talheres de plástico), carvão e lenha. Você e suas missões terão uma estadia agradável nesta casa bem conservada - ambiente tranquilo e relaxante. Definitivamente não é a sua típica cabana sombria. Você não vai se decepcionar como temos muito orgulho em fornecer um ambiente para memórias de verão do divertimento! Por favor, sinta-se livre para e-mail com perguntas ou imagens adicionais. Banho recentemente remodelado. toalhas de banho fornecida para seis pessoas. água mole. Loved waking up to the loon calls and the peacenees of the lake and sounds of the animals. Neighbors were nice and the ppl up there were nice. Great area to stay in. Glad you enjoyed some piece and quiet along with sounds of mother nature with your family. Love the sounds of the loons - A true up north sound of nature. I don't care what the temperature is outside spring thru early fall - I will always have a window open enough to hear the calls and wails of the loons late night and early mornings. It's a sign of spring when you here their calls in the spring after they migrate back north. We had a great time at our stay! The cabin had everything we needed for our stay. It was very clean, comfortable, and charming! Communication from the owner was great as well, no surprises! *One note... and this is no reflection of this cabin/owner: if you are renting a boat on Bay Lake, double and triple confirm your boat reservation. We had issues with two seperate boat rental outfits at Bay Lake. They are both "old school" pencil & paper reservation "systems". Our vacation could have been utterly dissappointing, but God is good and things worked out. 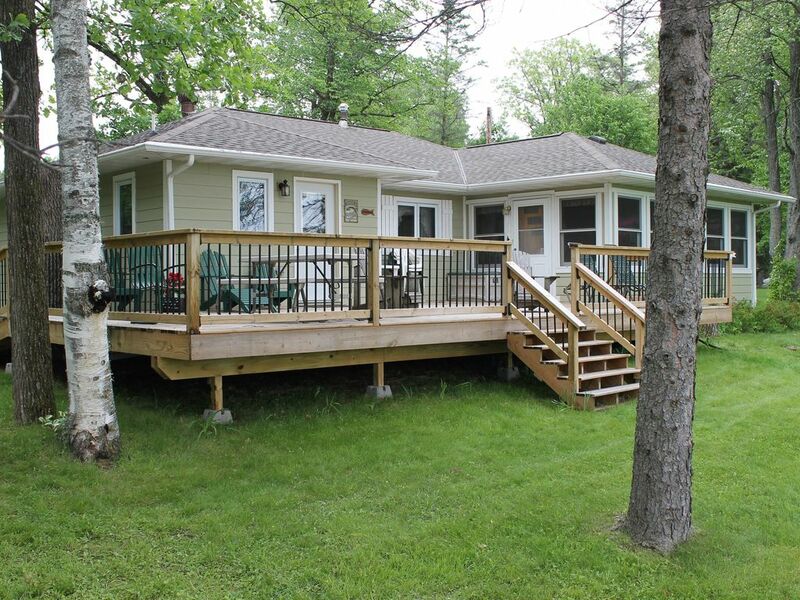 Great property on a great lake! We stayed at 4 different cabins on 4 different lakes this summer, all in this same general area. This property was easily the best one we stayed at. First off, it felt more like a home than a cabin, which means it was clean, well-stocked, and had plenty of room. The deck out back overlooking the lake was great, and the fishing on the lake itself was also excellent. We really appreciated all the little touches, which made it clear the owners know what they are doing. They were quick to respond to questions and easy to deal with. Thank you for this wonderful review. Your feedback is greatly appreciated. We are so glad you enjoyed your stay at our cabin. We do take great pride in our home and provide all the "extras" we can so our guests can have a very enjoyable time on Bay Lake. Overall the property was very good. The lake is right there for the enjoyment of same. Very comfortable cabin. Very tastefully decorated and accommodating. Porch and deck facing the lake were awesome to use. Highly recommend the cabin. Unless of course I am trying to schedule a stay!! Thanks so much for the 5 star review. We are glad you had a very enjoyable stay over July 4th. We love the large deck too. If we are not on the lake, we are on the deck. We look forward to having you back. Enjoyable fall week in MN. Leaves were at peak color and temperatures were in high 60's. Couldn't have asked for better weather. We were also was able to attend Ruttger's Oktoberfest while here. Home was very comfortable and cozy. Had everything we needed. Highly recommend. The owners of this rental are wonderful. They worked with us when we had trouble figuring out the VRBO site and were very prompt with getting our deposit back. The cabin is clean and spacious. It has everything you need. My husband and I loved sitting out on the deck every morning enjoying the lake view and a great cup of coffee. The cabin is only a short way from town - so if you need anything you can get it. The lake is right there! The lake is just the right size. My boys loved skiing and tubing and we caught our limit in bluegill and enjoyed catching rock bass and small mouth bass too. My husband enjoyed relaxing in the hammock. The owners sprayed for ticks and mosquitos (so awesome!) so you can enjoy a fire without getting eaten alive. Thank you for helping us make such wonderful family memories! Glad you and your family had a great stay and an enjoyable time on Bay Lake. Bay Lake is a great lake for tubing and skiing. Glad you enjoyed the deck - We agree it's a great spot for enjoying your morning coffee. We hope to see you back for another vacation in the Brainerd Lakes area. Perto de atrações: Bay Lake Church Camp, 4 campos de golfe nas proximidades, Heartland Hockey Camp (6 milhas), Cuyuna Country State Recreation Area (13 milhas), Paul Bunyan Land (10 milhas), Rogers Berry Farm (6 milhas) tem u- escolher morangos e mirtilos quando na época, Black Bear Cerâmica (6 milhas) loja de cerâmica artesanal, pesca no Lago Mille Lacs, Mille Lacs Grand Casino (15 milhas). Garrison (6 milhas), Crosby (12 milhas) e Aitkin (20 milhas) têm restaurantes e mercearias. Brainerd atrações: Paul Bunyan Trail, Northland Arboretum, Parques Aquáticos, Teatros, Brainerd International Raceway (20 milhas). Weekly rentals only during peak season! (minimum stay of 6 nights with change over day on Saturday) *** Weekend rentals are considered when request is within 30 days of arrival date with a 3 night minimum stay @ $200/night *** Weekend rentals will require payment in full at time of reservation *** Check-in 4pm Check-out 11am (The cleaning company needs 4-5 hours to clean for the next arrivals). 50% due at time of reservation (Includes $500 deposit). Balance due 45 days before arrival. Cancellation Policy Prior to the Check-in Date: If Guest wishes to cancel his/her reservation, total monies (rental fee + deposit), less $75, will be refunded as follows: 100% (less $75) if cancelled 60 days prior to the Check-in Date 50% if cancelled less than 60 days of Check-in Date Note: Until reservation is confirmed, rates are subject to change without notice.